Is boxing the new cricket? 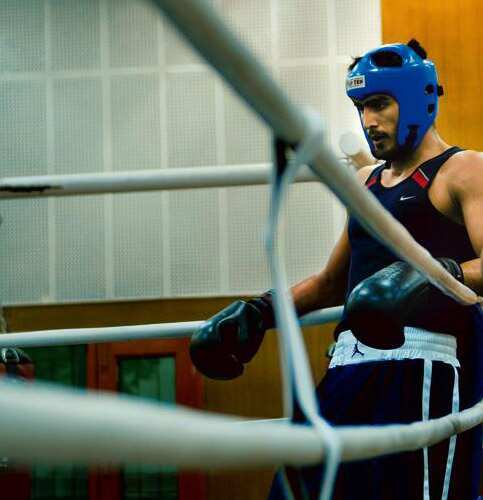 Leading the pack: Olympic bronze medallist Vijender Singh in training. Dinesh Sangwan is surprisingly light on his feet for a 6ft-tall man who weighs in at 81kg. His fists are the size of large hammers, and his face as hard as a rock frieze, but when he moves inside the ring, he’s positively dainty. Swift changes in direction on tiptoes, subtle changes in pace and rhythm responding to his trainer’s drill—except that his punches land like a wrecking ball hitting a wall of concrete. At close quarters, just the sound is scary. Click here to listen to the Lounge Podcast. A few feet away, Jitender Kumar looks wild, desperate. He’s skipping in a blur of rope, pushing the boundaries of his speed and endurance in one motion. His eyes are dilated and manic. Akhil Kumar throws in advice every few minutes. “Reach out more, Dinesh, rotate your shoulder, and get your hands completely straight." “Good, Jitu, good. Now one more time." Inside the brand new boxing hall at the Netaji Subhas National Institute of Sports (NSNIS), Patiala, where Sangwan, Akhil and Jitender have been training since the beginning of the year, is a story so rare in Indian sports that it is almost unprecedented—an assembly line of world-class champions; a talent pool that ensures Vijender Singh’s bronze medal at the 2008 Beijing Olympics, India’s first in boxing, will not be an isolated example. The list of Indian boxers who have won at international competitions since Vijender’s triumph points to nothing less than a revolution—Jitender, bronze at the 2009 Asian Boxing Championships; Sangwan, gold at the 2010 Commonwealth Championships; Thokchom Nanao Singh, the first gold medallist at the World Youth Boxing Championships (2008); Suranjoy Singh, the first gold medallist in 15 years at the 2009 Asian Boxing Championships; Vikas Krishan Yadav, the second world youth boxing champion (2010); Chhote Lal Yadav, 2010 South Asian boxing champion—a roll-call of winners that even a couple of years back would have been unthinkable outside of any sport but cricket. Compare that list with our previous triumphs—Dingko Singh’s gold at the Asian Games in 1998 came 16 years after Kaur Singh won at the same event. Mohammed Ali Qamar’s gold at the 2002 Commonwealth Games was the next big victory, before Qamar slipped through the gap and disappeared. Now that’s the story we are used to—a medal every decade or so, black holes in between. 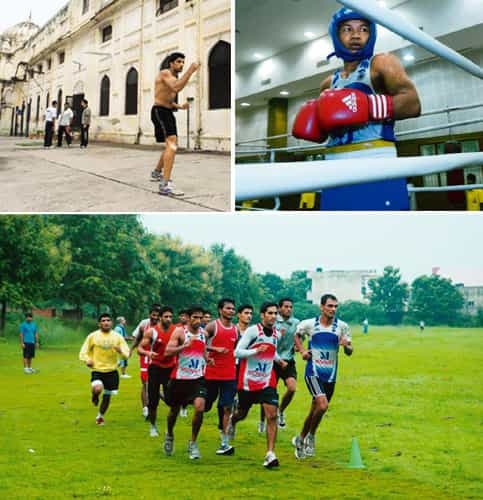 Inside the ring: (clockwise from top left) 2008 World Cup bronze medallist Dinesh Sangwan shadow-boxes at Netaji Subhas National Institute of Sports (NSNIS), formerly the Maharaja of Patiala’s palace; Suranjoy Singh, popularly called ‘Mike Tyson’, gets ready to spar; and national boxing champion Chhote Lal (front, centre) leads the team during endurance training at the NSNIS grounds. “I could never have imagined this change," says national boxing coach Gurbax Singh Sandhu, who has been at the helm of the sport on and off since 1990. Akhil, though, had seen the change coming. He had shaped the change himself when he won gold at the 2006 Commonwealth Games in Melbourne, and then beat Russia’s Sergey Vodopyanov, the then world champion, at the 2008 Olympics in a pre-quarter-final bout. Post-fight, Akhil declared to journalists, with his trademark cocksure grin, that Indian boxers were aiming for gold. “Then I wasted it all by losing in the quarter-finals," Akhil says, “but perhaps I changed the way people look at Indian boxing. I’ve seen our boxers trembling with fear as they approached the ring—I showed them that you can walk in with a smile. No one before me had the courage to say we’ll be fighting for medals, for gold." Akhil, Vijender, Jitender and Sangwan, who were part of India’s five-man boxing squad at the 2008 Olympics, all began their boxing careers in Bhiwani, a small, dusty farming town in Haryana, under coach Jagdish Singh, who runs the Bhiwani Boxing Club. They are the boys from India’s “Little Cuba"—so named because of Cuba’s dominance of the sport. “Vijender’s Olympic medal changed everything," says Jagdish. “Suddenly the media’s focus turned to boxing. Newspapers and TV spread the message in small towns and villages. Money started pouring in. Sponsors started showing interest." Training day: (left) Asian Championships bronze medallist Jitender Kumar cools off after a practice session; and world No. 1 middleweight boxer Vijender Singh instructs a fellow boxer during a training bout. The economics of the sport changed dramatically after the 2008 Olympics. “Where we would get, say, ₹ 50,000 from the Haryana government for winning a medal at an international championship, we are now getting ₹ 10 lakh," says Akhil. Former Manipuri boxer Dingko Singh was awarded ₹ 5 lakh by the government after his 1998 Asian Championships victory. “Now a boxer who wins the Asian Championships will be awarded 10 or 15 times that money," Dingko says. “I had no sponsors either, before or after my win, but now even junior boxers are being signed up by sponsors and sports management groups." In February, the normally cash-strapped Indian Boxing Federation (IBF) entered into a four-year marketing deal with sports management group Percept. In April, it signed a $1 million (around ₹ 4.63 crore) sponsorship deal with Monnet Ispat and Energy to finance the national team. In 2009, Sahara India, sponsors for both the Indian cricket and hockey teams, decided to fund up to 13 Indian boxers till the 2012 Olympics. The International Amateur Boxing Association (Aiba) will also launch the World Series of Boxing this November, a franchisee-based competition that will see Jitender, Akhil, Vijender, Sangwan and Jai Bhagwan (yet another Bhiwani boy) turn out for the Delhi team. The boxers’ contracts range from $30,000-100,000 annually. They will also get $5,000 for every bout won, and $1,000 if they lose. Percept’s joint managing director Shailendra Singh feels boxing is on the brink of becoming India’s “second sport", after cricket. “It’s not just a flamboyant, aggressive sport with great personalities fighting in the ring," says Shailendra, “It’s also a sport that doesn’t need the kind of infrastructure that hockey or football needs. You can have a boxing tournament in a school, a college, a shopping mall. It’s edgy and entertaining—that’s the perfect mix for young spectators." New blood: Akhil Kumar’s gold medal at the 2006 Commonwealth Games was the beginning of a new era for Indian boxers; and a practice session in progress. “Boxing was going nowhere in my time," says Dingko, “now I have no doubt that it’s the fastest rising sport in India. It makes me so happy that I don’t care at all about what I got or didn’t get from the sport." This spurt in popularity, though, has not rubbed off on women’s boxing in India, despite the success of Manipur’s M.C. Mary Kom, who won an unprecedented fifth World Championships title on 18 September in Barbados. “I am hoping that this will change once women’s boxing becomes an Olympic sport," says Mary Kom. “Right now, it’s not even part of the Commonwealth Games, which is sad. But it will feature for the first time in 2012 (Olympics) in London." Such is Mary Kom’s dominance of the sport that the Aiba has officially credited her success as one of the reasons women’s boxing has been included in the Olympics. Sangwan is moving rapidly around the heavy bag, throwing punches in a hard, loud, staccato rhythm. The wooden floor is soaked in a circle of sweat. Move. Smack. Sweat. Move. A trainer screams into his ear: “Keep hitting, keep hitting, 30 seconds more, 20 seconds more, hard, hard, hard." The morning training session at the new boxing gym at NSNIS Patiala is almost at an end. The last minutes are always excruciating to watch. The boxers hang by the thinnest thread of endurance and strength after 3 continuous hours of running, sprinting, push-ups, skipping, punching and sparring. The trainers need to scream inches from their ear to push their brains to come up with that final spurt of energy and concentration. Every day, for a few hours after morning training, the boxers develop the slur of a man with high fever. As the whistle blows to end the session, Sangwan staggers to a bench at one end of the gym, and sits down with a heavy thud. At 22, Sangwan feels his time is now. During the 2008 Olympics, the light heavyweight (81kg) boxer crashed out in the first round, losing to Algerian boxer Abdelhafid Benchabla. A few months later, he thrashed the same opponent at the Boxing World Cup in Moscow to win a bronze medal. “At the Olympics I felt really young and inexperienced, and I thought it was too early for me to be in the big league," Sangwan says. “But I wasn’t demoralized. I thought, all right, if I have qualified for these events, I’m good enough. I can hold my own. I’ve only improved since then." Sangwan’s entry into boxing was almost inevitable. His brother was a boxer, and all the young men around him in his home town in Bhiwani seemed to be in training to get inside a ring. With his broad, big build, the choice was easy for Sangwan. “But it was difficult in the beginning. I used to get injured a lot, and often wondered if this was the right way for me to go," he says. But my father was a conductor with Haryana Roadways, and the only earning member of the family, and I knew from a very early age that boxing may be my ticket to bigger things." Compatriot and bantamweight boxer Jitender Kumar has a similar story to tell—he had no interest in boxing when he was growing up. “I only played cricket." But his elder brother Surinder, a national-level boxer who used to train at the Bhiwani Boxing Club, took him to the club one day and introduced him to Akhil. “I was 15 then, and it changed my life," Jitender says. “This is what happened to a lot of young men in Bhiwani at that time. They fell in love with the senior boxers in the town, got hooked to the glamour of watching them train." That connection just got stronger and stronger after the 2006 Commonwealth Games and the 2008 Beijing Olympics. “Bhiwani was the epicentre of this change." Jitender says. If Akhil and Vijender are the first generation of boxers to really push the sport into the limelight with their consistent victories, Sangwan and Jitender are the next generation, gearing up for what they predict will be an unprecedented medal haul at the 2010 Commonwealth Games in Delhi. “When I started, people in my village thought boxing was about gundagardi and violence," says Sangwan. “Now they think that it is a given that I will win a gold at the Commonwealth Games. I think it is a given too." Bhiwani is ready with a third generation too—18-year-old Vikas Krishan Yadav, the reigning youth world champion, and a bronze medallist at the inaugural Youth Olympics held in Singapore in August. “There has been a complete change in the culture of boxing in the country," says Vijender. “Before Beijing there was no energy in the sport. People would work very hard, but were never sure where that would take them. Now the ambitions are concrete. The boxers know that winning medals at international competitions is possible, even mandatory." That culture has spread now beyond Bhiwani and across India. Nanao Singh, 19, the 2009 world youth champion, hails from Manipur, also home to 2010 Commonwealth Championships gold medallist Suranjoy Singh. Shiva Thapa, 17, silver medallist at the World Youth Boxing Championships in 2010, comes from Assam. Chhote Lal Yadav, 22, national champion for three years running, is from a village near Varanasi. “It’s like a wave of talent that’s sweeping across the country," says Akhil, “there’s so much quantity that quality is almost assured." It’s the evening session at NSNIS, Patiala, and the boxing gym shines like a summer day under the overhead lights. The sound of punches hitting bags or opponents is deafening. Suranjoy Singh weighs just 52kg. His opponent in the ring outweighs him by 8kg—and that’s 8kg of pure muscle. Despite the advantage, Suranjoy has him on the run, darting around the ring to get his opponent on the ropes. And suddenly, Suranjoy spots the opening he was looking for and unleashes a blur of punches—to the head, the stomach, the face. Ten seconds of mayhem that all but finishes off the fight. “Very good, son, very good," Sandhu says from the sideline. “One more round now." Never get into a street fight with a guy who looks puny. He might break every bone in your face before you can even move your arms to protect yourself. “We call him Mike because he’s in love with Mike Tyson," Sandhu says. “He also had a temper like Tyson which did him no good." Later on, Suranjoy meets us outside his hostel under a cloudy sky, and offers us some sunflower seeds. “From Manipur— very tasty." He even looks a lot like a young Mike Tyson. “Yes, I had a terrible temper. I used to get really mad if someone fouled me," Suranjoy says in a barely audible whisper. “I used to lose my mind and lose the bout." The 24-year-old boxer was one of India’s strongest contenders as far back as the 2006 Commonwealth Games, where he was part of the team, but his habit of losing his temper kept him away from medals. As Suranjoy’s fiery attitude got the better of him, his performance began sliding. He was left out of the national boxing camp in 2007, and did not qualify for the Beijing Olympics in 2008. “Then I saw our boxers fight brilliantly at the Olympics and realized what I was missing out," he says. “I told myself I need to work harder, be smarter, and make it count when I’m called back to the India camp." Dingko, who had his own anger-management issues during his boxing days, worked with Suranjoy to try and calm him down. “When you are training a boxer, you have to first understand his mind. What are his fears? What are his motivations?" Dingko says. “Suranjoy thought that if he gave up his aggression, he would lose his edge. But just the opposite was true. I had to work really hard to get it through to him that I wanted his good by lowering his aggression." When Suranjoy finally gave up the ghost of anger, the results were immediate. His haul of six international gold medals in 2009 (including wins at the intercontinental President’s Cup, the European Grand Prix and the Asian Championships) makes him probably the best boxer in the country right now. Unlike Suranjoy, Chhote Lal Yadav carries a little bit of anger with him in the ring, and he makes it work for him too. His younger sister Laxmi lost her vision in a viral attack four years ago. Since then, the 22-year-old boxer’s only focus has been to win as many championships as he can to fund his sister’s treatment. He has kept his word. He has won India’s Senior National Boxing Championships three years in a row since 2008. He has been so dominating in the ring that in 2009 he forced his opponent in the final to a standing count in the very first round. He was leading 8-1 in the second round when the referee stopped the contest. This year, he repeated the feat in the final against former Olympian S. Suresh Singh. While on their way to Delhi from Varanasi to watch that fight, his family was mugged on the train. The assailants snatched the earrings his mother was wearing. He smiles at the irony of it all, sitting in a small tea shack outside NSNIS, Patiala, as dusk falls. “I can only do what I do in the ring," he says. Chhote Lal’s father, a class IV employee in Indian Railways, used to force him to get up early in the morning and work out in the rail yards in Varanasi. When the Bombay Engineering Group’s sports scouts came to Varanasi to pick up talented youngsters, Chhote Lal, who was 10 at the time, topped the trials. He joined the Army Institute for Sports, Pune, and began his career with swimming, before the boxing coaches at the institute convinced him to switch track. “I was ragged from the first day by the other trainees," he says. “They used to tease me saying I ran away from home to win Olympic medals, I even got beaten up." Pushed into a corner, Chhote Lal began training secretly at night. “I would eat a very light dinner so I could hit the gym again at 10 in the night. I would train for 2 hours, and sometimes just go to sleep inside the gym," he recalls. Forty-one boxers were training at the Boxing National Camp in NSNIS that ends on 25 September. They had eight coaches, a physiotherapist, two masseurs, two groundsmen and a doctor assigned to them. The Mittal Champions Trust, a private body that works with athletes in India, provided them with another physiotherapist. “Before Vijender’s medal, we had maybe one coach for 30 boxers," says Suranjoy. “Now we get individual attention. Even a few years back, when we would train there were hardly any coaches to be seen, and now the coaches reach the gym before us!" Olympic Gold Quest, another private organization that provides support to athletes—funding their medical care, kit and foreign training stints—has signed on Suranjoy, along with youth champions Nanao and Thapa. “The boxers are one of our main focuses for a simple reason," says Olympic Gold Quest’s COO and former Indian hockey captain Viren Rasquinha. “They have the potential to win Olympic medals." The Mittal Champions Trust, whose signings include Akhil and Jitender and a host of junior boxers, also count boxing as a “priority sport" for the 2012 Olympics. Manisha Malhotra, the administrative head of the Mittal Champions Trust, feels that now that a platform has been built, the momentum should not be lost. “Each step now will get tougher and tougher," she says, “and the boxing federation must grab their chance and upgrade all their systems. Though the talent management has got better, it’s still nowhere as good as it can be. There is a real fear that the federation will not be able to shake off their inertia, and we may not get any better for the 2012 Olympics." Jagdish has the same fears. “Though it feels right now like a distant, impossible dream is turning into reality, it can collapse anytime." He says: “Look at what’s been happening in the lead-up to the Commonwealth Games! This was a golden opportunity to push Olympic sports in the country to new levels, but it has been wasted. Even after Vijender’s triumph in 2008, we hardly got any help; even the Sports Authority of India (Sai) centre in Bhiwani saw minimal development." “Players lose heart when they see and hear about the kind of scandals that have hit the Commonwealth Games," says Akhil. “It’s a complicated balance right? Like the photo shoot you just did here—you take 200 photos, and then you’ll pick three. There’s the photographer’s talent, our expressions and body language, the number of photographs you’ve taken, and then your skills at identifying the best of the lot. Anyone messes up, and it’s all wasted. Now that’s a good comparison. Did you record it?" he says, with a wink and a whistle. Vijender Singh, Dinesh Sangwan and Suranjoy Singh have qualified for both the 2010 Commonwealth Games in Delhi and the 2010 Asian Games in Guangzhou, China. Akhil Kumar has qualified for the Commonwealth Games and Chhote Lal Yadav, for the Asian Games.